If you're a builder, you've asked yourself this question a thousand times: what more can I do to make my homes unique and even more appealing to home buyers? The simple answer may surprise you. Designer privacy windows. Available for use throughout the entire home, cost-effective privacy window options range from etched or silk screened glass designs to true glass block to acrylic block. The wide variety of style choices and sizes gives you the opportunity to incorporate privacy windows into any room. In the competitive Texas marketplace, Westin Homes has discovered a "secret weapon" for helping their homes stand out: decorative privacy windows from Hy-Lite. Westin Homes constructs 750 homes each year in neighborhoods and master planned communities. 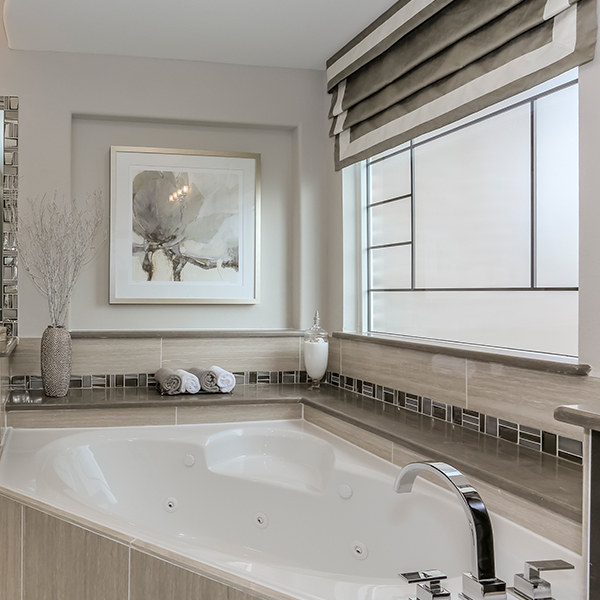 To offer homebuyers a unique option for their master bathrooms, the company uses the Hy-Lite Model Home/Design Center Program to showcase Baroque, Prairie and Metro styles from the Home Designer Collection in their model homes. The Home Designer Collection (which also includes a Mission style) includes fixed silkscreened windows in a variety of sizes, including 48" x 48", 48" x 12", 36" x 60" and 24" x 24".